Tribute to my wife. Done by Jay at Sinful Inflictions in Whitby On. Canada. The heavy black outline at the top edge of the wing is very distracting. things don't end in black lines in real life, nor should they in art. The hand is wonky too. Face is nicely done and pretty. That looks amazing (and it's really sweet you got it for your wife). Definitely the best portrait tattoo I've seen. Hey nice tattoo. 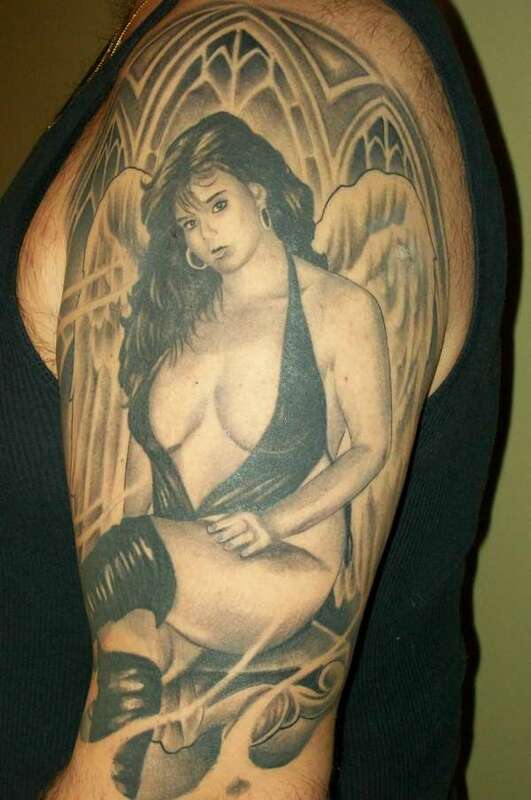 You should enter it in the World's Best Tattoo competition. The winner gets $10,000 in cash and prizes. Log on to www.tattoolapalooza.com for all the info.